Soups are a great way to save time spent in the kitchen. Often, you can turn on the stove and just let the food cook while finishing up household chores or other scheduled activities. The best thing about this recipe is that it’s not only easy to prepare and nutritious, it’s also low in digestible calories. Thoroughly wash lentils and beans 4-5 times until water runs clear. Soak in a large bowl overnight. On high heat, add in the lentil/beans along with the water to a large pot. Add more water 3-4 times, water to lentil/bean ratio. Bring to boil and then drop the heat down to medium-low for rapid simmer. In a separate small pot, add oil to hot pan, add in the onion, ginger, garlic, turmeric, garam masala, fenugreek seeds, salt, and pepper. Cook for 3-4 minutes until you can smell the spices and the mixture starts to stick together. Add in the tomatoes. Mix on medium-low heat for another 3-4 minutes until the mixture once again starts to form a ball. Cover pot and cook until lentils/beans cooked through. About 1-1.5 hours from start to finish. Mix throughout cooking as needed. 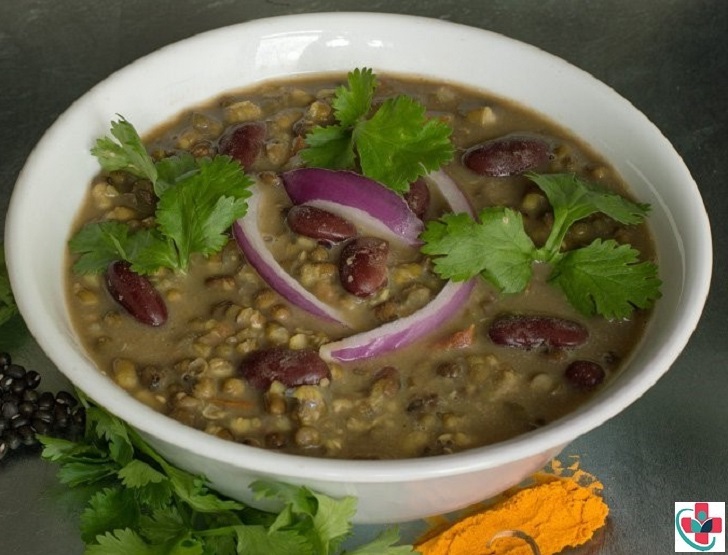 Serving suggestions – Top off the soup with fresh chopped cilantro leaves and small diced red onion as desired. Enjoy as a soup with a side of Nan Bread or toast as desired or on top of brown basmati rice and enjoy as a vegetarian rice bowl.